Note : Your request will be directed to AR RF/Microwave Instrumentation. The 60/40S1G18B is a portable, self-contained, air-cooled, dual-band, broadband, solid-state amplifier that operates from 0.7 to 18 GHz. The amplifier provides an output power of more than 40 watts from 0.7 to 6 GHz and more than 60 watts from 6 to 18 GHz. It has been designed for applications where instantaneous bandwidth, high gain and linearity are required. It has a Digital Control Panel (DCP) which provides both local and remote control of the amplifier. The digital display on the front panel indicates control status and reports of internal amplifier status. All amplifier control functions and status indications are available remotely in GPIB/IEEE-488 format, RS-232 hardwire and fiber optic, USB, and Ethernet. 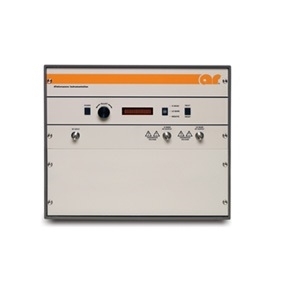 This model is designed to have low spurious signals, exhibit very good linearity, and is extremely load tolerant which enables it to be used in many RF applications such as RF susceptibility testing, antenna/component testing, and communication technology testing. It can be used as a test instrument covering multiple frequency bands and are suitable for a variety of communication technologies such as CDMA, W-CDMA, TDMA, GSM, UWB, WiMAX etc.